How difficult can building an Eco-friendly driveway be? I thought it would be easy, since everybody knows that Toronto wants to be the ‘greenest’ city in North America. But in our tree-lined, asphalted, concrete corner of central Toronto (North York) it has been a complicated adventure, and not for the faint of heart. Frankly, I wondered if we had to have the whole world on our side before we got action… Not knowing where to turn next, I chose the shortest but most perilous path. Fortunately, the Mayor’s office thought it was contradictory too. They assured me, “Yes, we do want Torontonians to be ‘green’. We never thought people would actually want to tear up their interlock driveways, but if you do that’s great! We’ll try to find a way that you can have your green driveway within our existing rules.” I hung up the phone thinking well maybe there was a chance we would get approval. It sounded like they were taking it seriously. We chatted about the need for permeable driveways, and how our driveway project could be a useful example for the City. I agreed to submit a plan detailing what our ‘green’ driveway would be made of. On June 7th two Transportation officials, Eric Jensen from North York and Kyp Perikleous from Toronto, visited our home for a site inspection to discuss the Pilot Project, and what we needed to modify in our plan to comply with all the bylaws. They didn’t like my novel idea to angle park on the City boulevard (I wanted to banish the rectangular driveway ‘strip’ that dominates most properties) but Kyp came up with a novel suggestion which puts the driveway over to the side integrated with the flagstone walkway. I agreed on the spot to the changes. On June 19th we got approval to be the first Pilot Project for a permeable green driveway. So, if you are reading this now because you want to build a green driveway, then please stay-tuned through my RSS feed. Over the summer, I’ll be giving updates on the creation of our verdant green, permeable driveway. 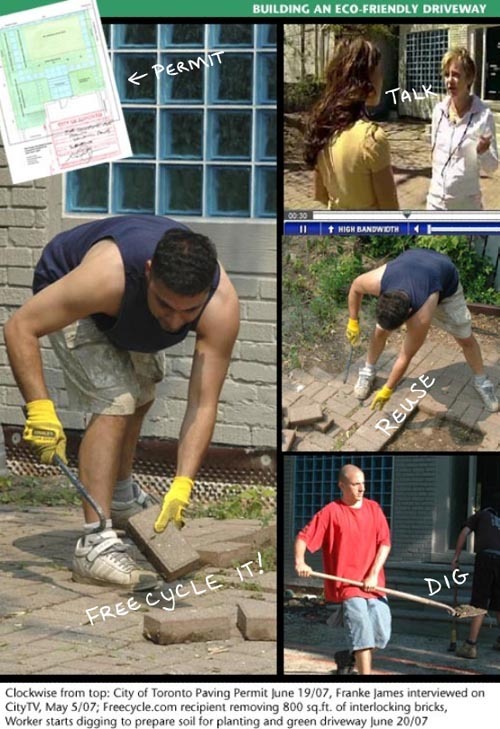 You can follow our adventure step-by-step from disposal of the old interlock (we gave the 800 sq. ft. away for free on www.freecycle.org) to excavation by hand digging and bobcat, through to soil preparation, installation, planting and maintenance. 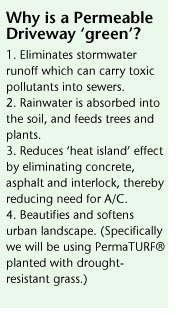 The key element in our permeable driveway is a product called PermaTurf which orginated in Germany, and is manufactured in the U.S. It is load-bearing (so cars can park on it without causing big tire ruts). But the big advantage for us is it will allow us to have a lush carpet of grass… And considering the hot and dry weather forecast for this summer, it will need to be drought-resistant! Congrats Franke on winning the right to build a green driveway! You go girl!! Eco-Lawn – Is The Grass Really Greener on the Other Side? I had an e-mail exchange with Franke James earlier this week and she happened to mention that she had enjoyed my post about ‘Water-Smart Gardening‘ and was wondering if I could recommend any drought-resistant grass species. I just bought a house and the first thing I want to change is the concrete drive to a green alternative. I assumed this will be easy and what a great way to “Green the City”. I think it would be easier to green drives than roofs!!! Sounds great….I am in Orangeville, Ontario and we are thinking of an alternative to large paved driveway. How did you fare in the winter with all the snow? Can you use a snowblower over the green driveway? If you do build a green driveway please let me know — perhaps we can post a photo on the site. I have a driveway with interlocking brick and in addition a cracked concrete pathway along the side of my house. I would like to make both permeable. Both cases it might present an opportunity to insulate the exterior foundation walls. Do you have any advice?